One of the limitations I’ve encountered with today’s all singing all dancing aircraft simulators is the total inability to simulate casual mapshift. 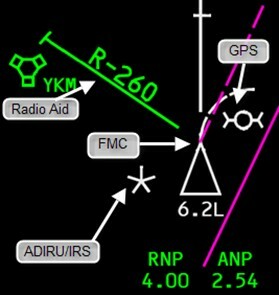 As you know, the position of the aircraft (for display on the Map and as used by a number of systems) – is determined by the FMC (Flight Management Computer). 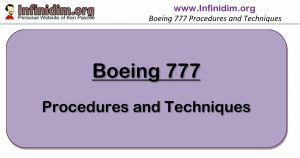 Of course the FMC actually has no inherent ability to determine position at all – it merely looks at the positions provided by other systems and uses that information to decide where the aircraft is. These systems include ADIRU/IRS (Inertial Reference System), Radio Navigation Aids and of course the now ubiquitous GPS. The FMC looks as these positions and uses the most accurate one – typically GPS – to update it’s own determination of aircraft position. This distinction is important. In the event of a GPS failure which causes the FMC to re-consider (for example) the ADIRU/IRS as the new position source, it will take some time for the FMC position to “wander” across to the IRS determined position. It’s not instantaneous – which is a good thing, given that the aircraft would take a sharp turn to head back towards track if the position reference were to change quickly. GPS is indeed ubiquitous, as these days at any point in space it’s not unusual to be able to gain position information from in excess of 12 satellites (your smart phone, which also sees GLONASS, has a lot more to choose from). This is a whole lot of redundancy and increased accuracy in position fixing. 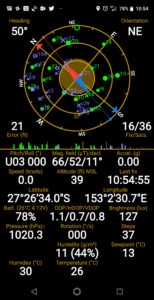 While that many satellites are unlikely to fall out of the sky any time soon (solar flare activity notwithstanding) the weak point is of course the onboard GPS equipment. Should it fail then we revert to 1980’s navigation technology of Radio Navaids falling back on ADIRU/IRS. Today’s IRS’s are stunningly accurate – after 14 hours of flight, despite an ANP of 20 miles or more – it’s not unusual to see less than a mile’s difference between the GPS and ADIRU. But that mile discrepancy is a significant impact on terminal navigation – were it not for radio updating of the FMC position. Isn’t it about time someone looked at the formula for determining the ANP of a current generate IRS? It sure seems like the numbers (which starts at about 4 nm/hr and ameliorates out to about 20 nm after 10 hours) seems a bit excessive when I’m scarcely seeing more than about half a mile drift on the IRS when I shut down after 14 hours). Oh – and if you’re not clear on the difference between the ANP of an inertial position and actual IRS drift then you’d better stop reading this and head back into the FCOM. 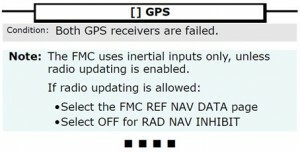 Therefore, it’s such a pity we turn off NAV RAD updating of the FMC position by default in the FMC during Pre-Flight. There’s a reason we do this and it’s based on RNP / RNP-AR approvals, but it does leave the ignorant exposed should GPS position fixing fail. From a training point of view – this is where the simulator frustrates me no end. You see today’s simulators are totally unable to simulate IRS drift, except as a hugely obvious simulated mapshift failure. IRS drift is actually a normal event – rather than a non-normal one. At any stage of flight, pressing the EFIS POS button will show some degree of IRS drift – along with the FMC ignoring it because GPS or NAV RAD is in use. If these other more accurate sources aren’t available – you won’t see IRS drift because the FMC is following the IRS – even though the drift is there; you now have mapshift. But in the simulator – the IRS doesn’t drift and no matter how long you fly for, the IRS position is superimposed right over the GPS position – which is totally misleading. This is where the GPS failure comes in. In preparation for RNAV RNP AR approaches – all radio nav updating in our aircraft has been disabled by default. 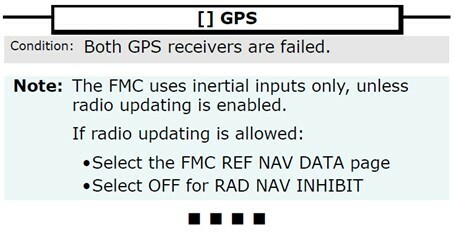 Hence if the GPS fails, the FMC will not use radio aids to calculate position – instead, it will default to the Inertial ADIRU/IRS position. Fortunately, the GPS Checklist encourages the use of radio navaids as a navigation source – but it’s not exactly clear about the need for it. Radio Updating of the FMC position is inhibited by default and checked in this position during pre-flight. 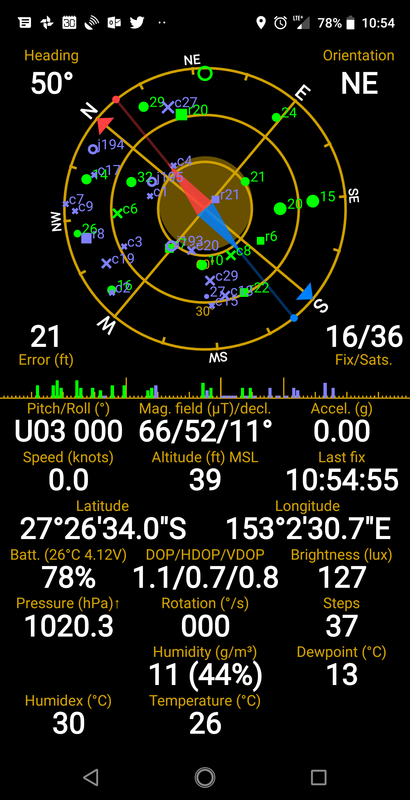 After a GPS failure, if radio updating remains OFF, all position fixing all FMC position (and subsequent LNAV Navigation) is based on IRS positioning. On a typical 14 hour flight to LAX, this means the aircraft could be anything up to 1 nm left or right of centreline if LNAV is used to position onto a precision or non-precision approach. Crew will need to enable radio updating and closely monitor navigation performance – typically via the EFIS POS facility.